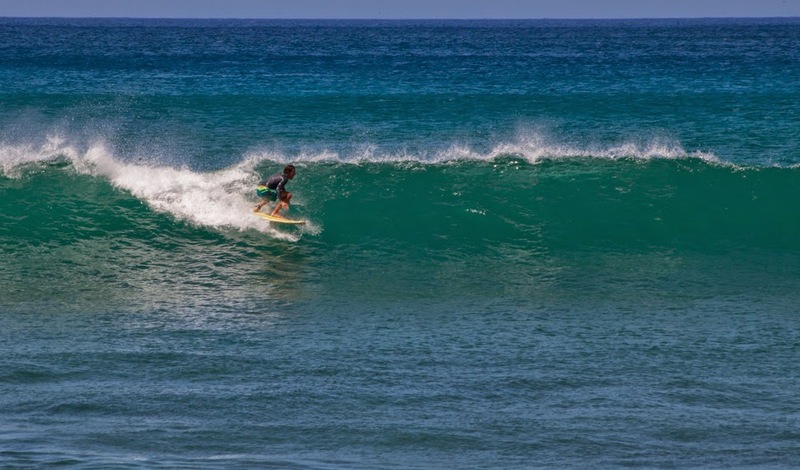 While the North Shore is flat calm and ripe for scuba diving, the South shoreline has all the waves for surfing. Waves churned up by winter storms thousands of miles away in the southern hemisphere make their way over the equator to land upon our shoreline here in Oahu. I have been pleasantly surprised by the size of the swells this summer. While the forecasts call for 2ft surf there are head high waves with windless, glassy conditions. It makes me realize just how blocked Maui's southern shoreline is by Koho'olawe island nearby. 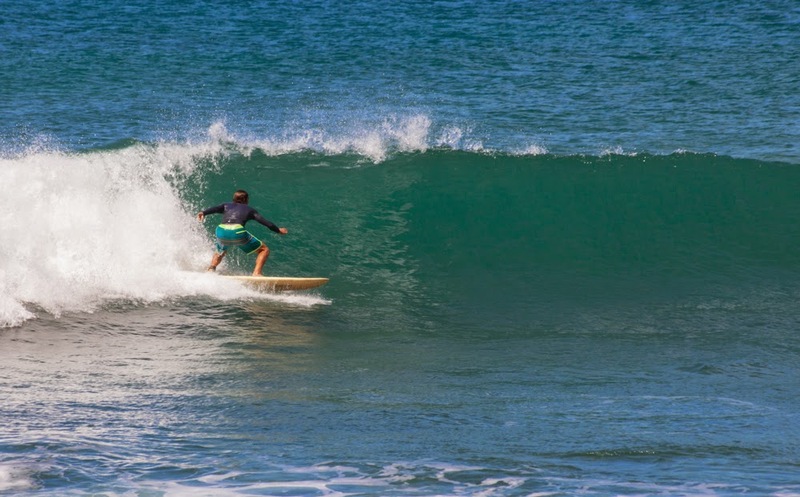 It would take a really big swell to make Maui's best waves start to open up. And forget surfing in the middle of the day or the afternoon. The wind would fill in and make conditions very tough. So I guess this means I better get these waves while I can. And while these swell was only a 2-3ft swell, I imagine at least one big one has yet to come. When it does I will be ready. 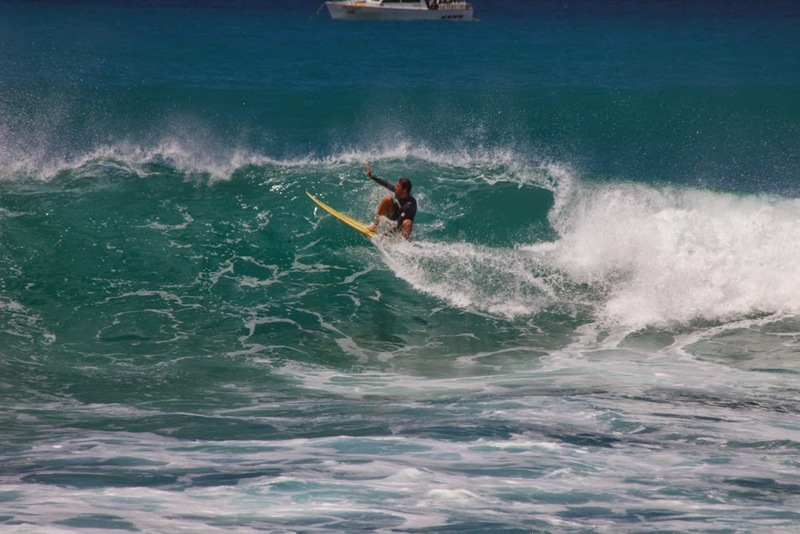 Heidi has been behind the lens for a couple of these south shore surf sessions. We have one secret spot where the waves break very close to the shoreline which is great for pictures. Hopefully the new lens port for the GoPro ships quickly and I can get some in the water shots too! 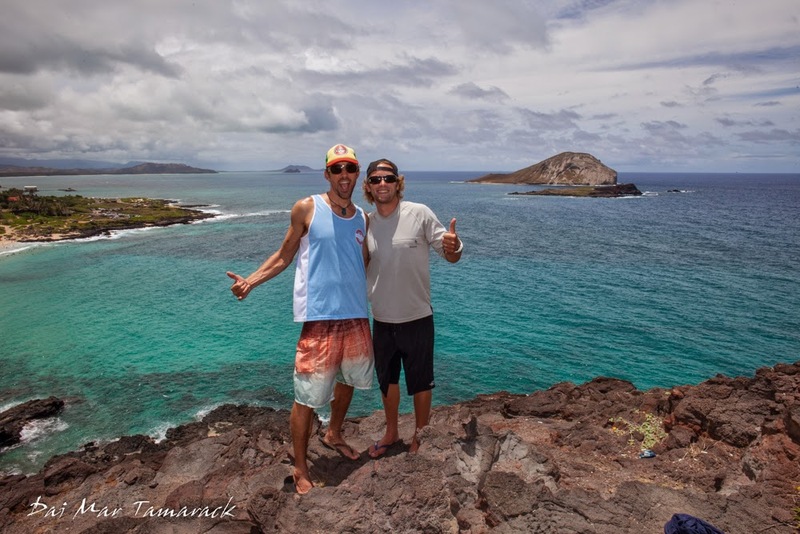 Ed and Jamie Do Oahu! 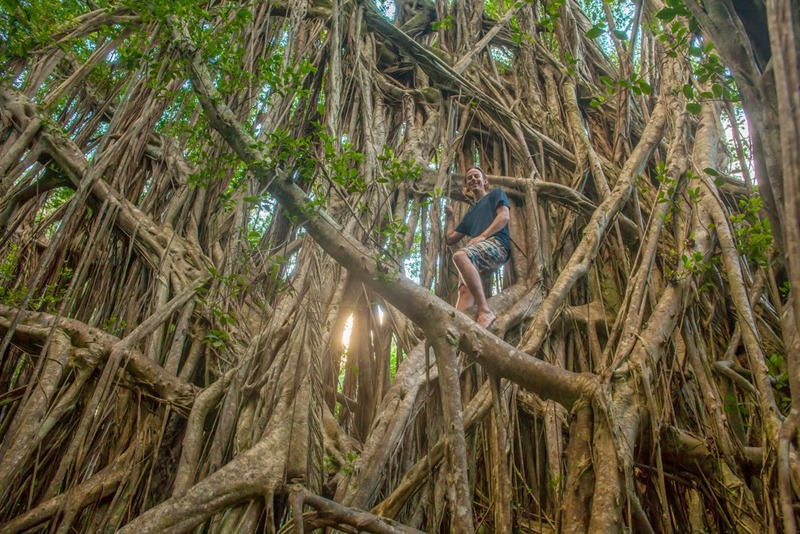 Ed and Jamie were in for adventure when they stepped foot onto Oahu. 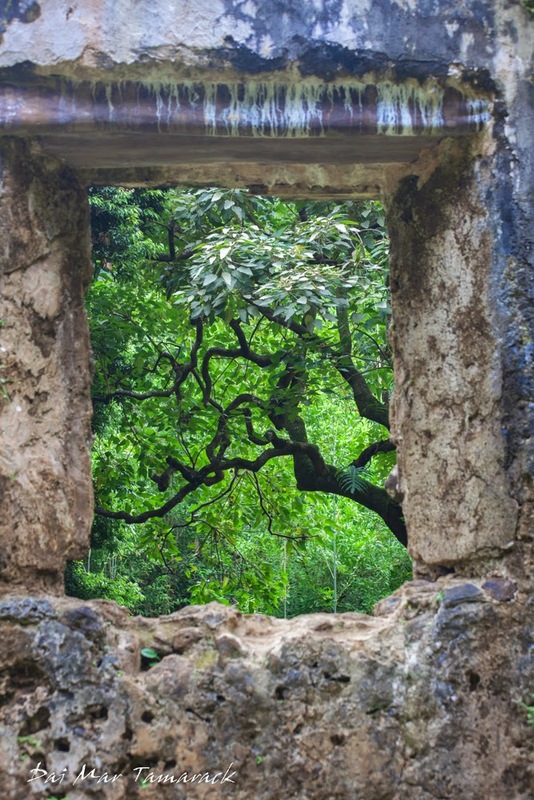 Right off the plane we headed through muddy jungle paths to ancient ruins before driving up a winding ridge road to an overlook of nighttime Waikiki all lit up. 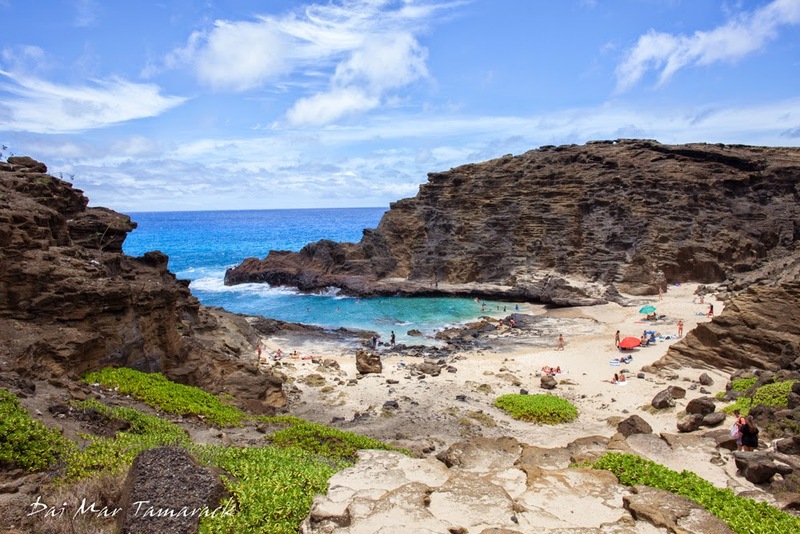 They experienced the underwater wonders that Oahu has to offer from the fabled Hanauma Bay to Shark's Cove on the North Shore. 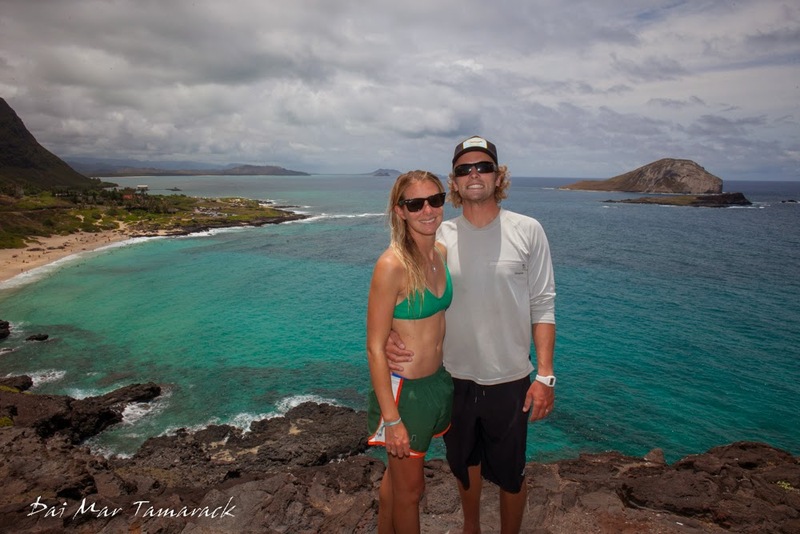 Jamie mastered snorkeling after only two times and Ed scored one of the best Oahu dives anyone could ask for. 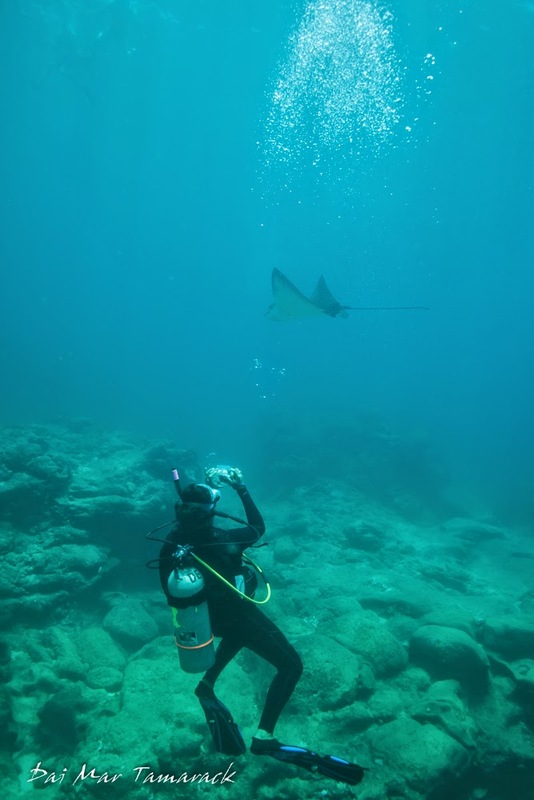 His underwater luck brought in some spotted eagle rays, moray eels, a sea turtle, and a rare encounter with a Hawaiian monk seal. Heidi even found a few nudibranchs to show him. Jamie saying "I've got this!" 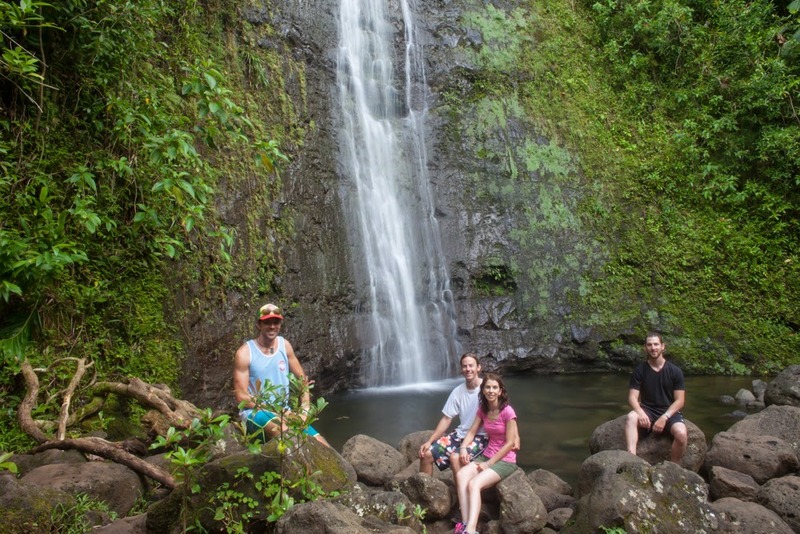 Throw in some waterfall hikes, Buddhist temples, overlooks, beaches, sea glass missions, and surf, and you would still only scratch the surface of their trip. It was great to combine Savannah and Hawaii. Even when I was busy Ed and Jamie were off on their own finding ballroom dance events or soaking up history at Pearl Harbor. I feel like this adventure pushed Jamie a little out of her comfort zone (hiking in sandals, snorkeling in the ocean) but she came through with flying colors. She and Ed just had a nine hour flight back to the east coast so they had time to catch up on some sleep....now its my turn! Made it to the natural rock bridge! 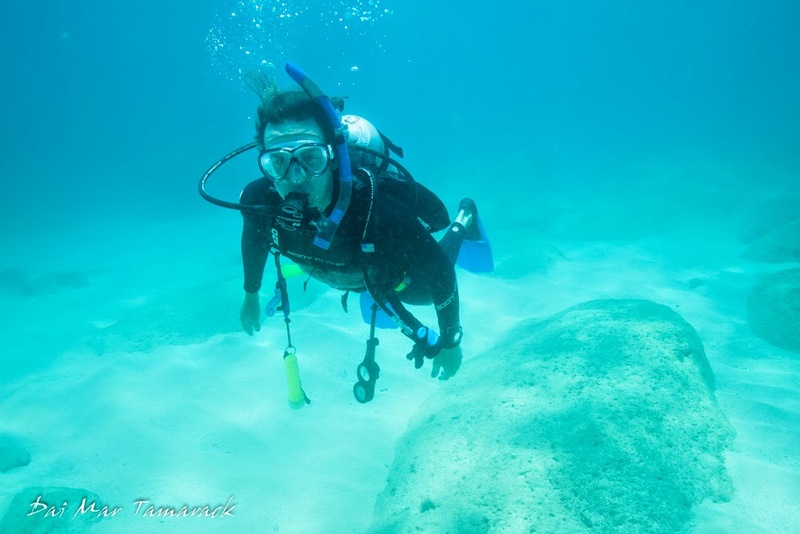 Ed's First Dive in Hawaii! I couldn't believe our luck. 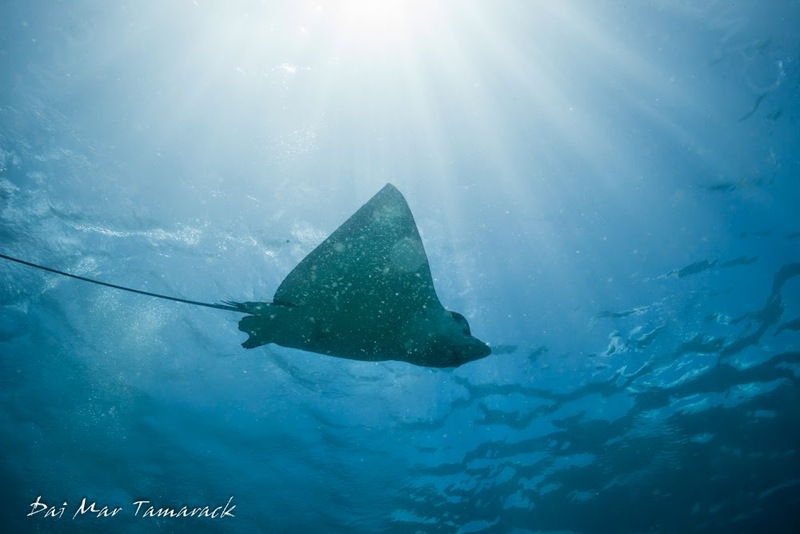 After the first initial pass from the two eagle rays we were visited by them again numerous times during the dive. 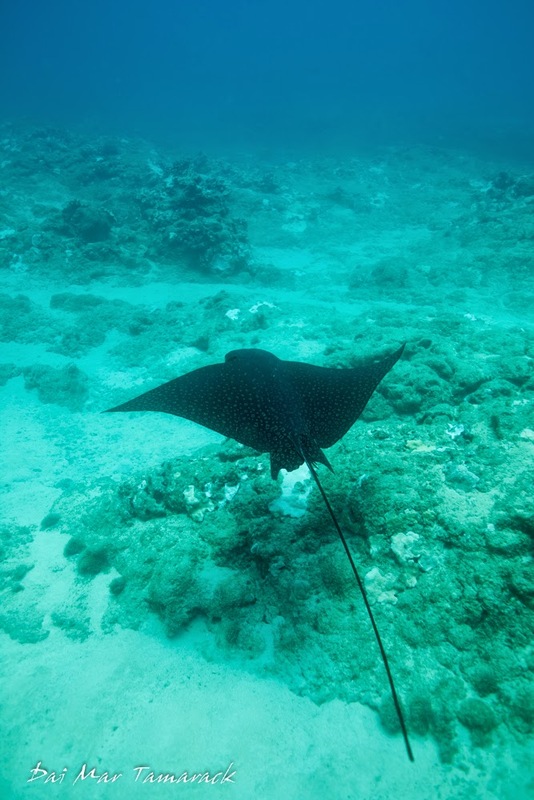 We saw a turtle and a few moray eels but every time I turned around one of the rays was back again. Ed was looking like a fish underwater so I was able to concentrate more on snapping some photos of the charismatic megafauna around us. I did lead Ed through a couple of tight swim thru's and caverns. 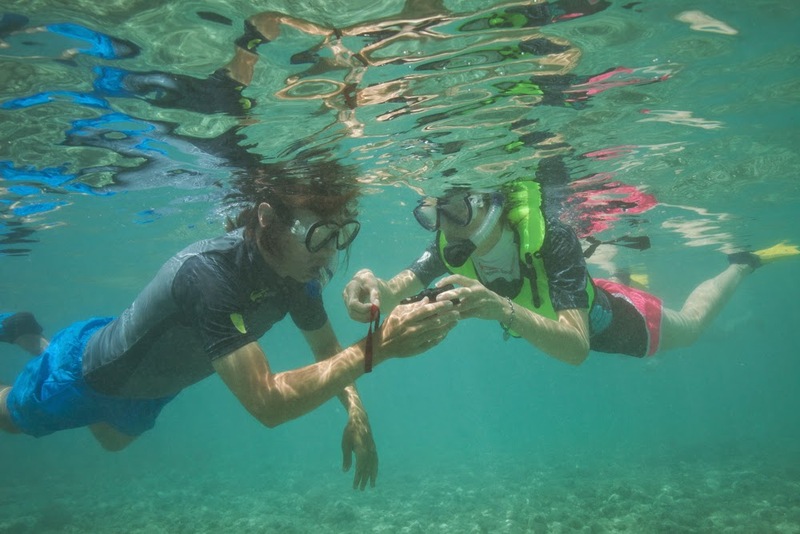 Heidi was busy finding and photographing different nudibranchs with her new underwater Canon S110 camera. She even found a nudibranch which had laid eggs on the eggs of a much larger nudibranch. I figured at this point that Ed was going to be pretty spoiled as this was his first dive after completing his open water certification course back in Georgia. What I didn't expect was the dive to get even more memorable. But that it did! 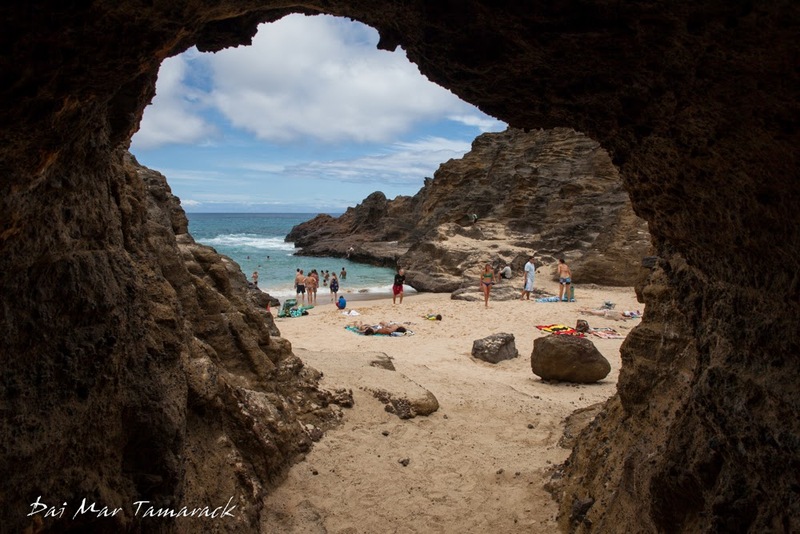 As we were kicking back towards our exit point I turned my head to check on Ed and low and behold there was a rare Hawaiian monk seal swimming about forty feet behind him! I snapped my tank banger several times while pointing at the seal. Heidi came fast and Ed got a good look as well. But this wasn't going to be a fleeting sighting. 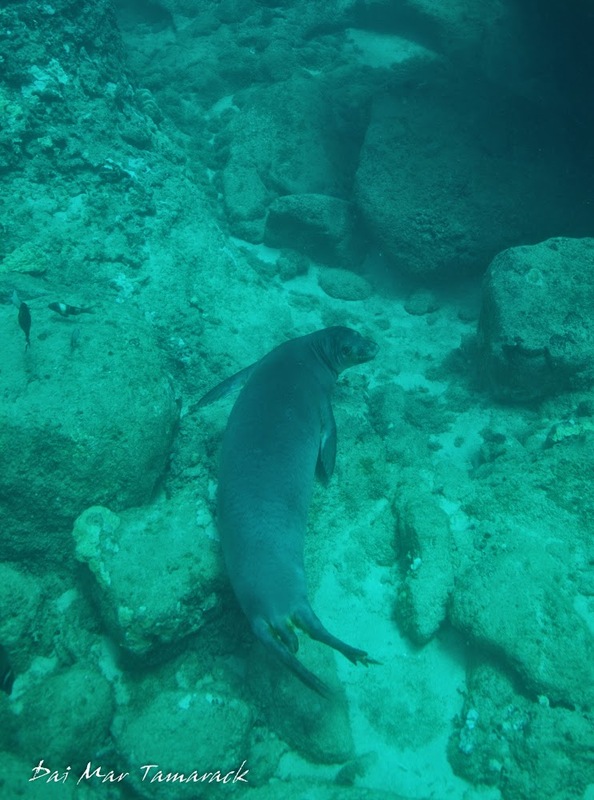 The monk seal stayed nearby, although far enough away for me to only capture mediocre pictures. We watched as it rustled around in the sand on the hunt for some benthic dwelling creatures. 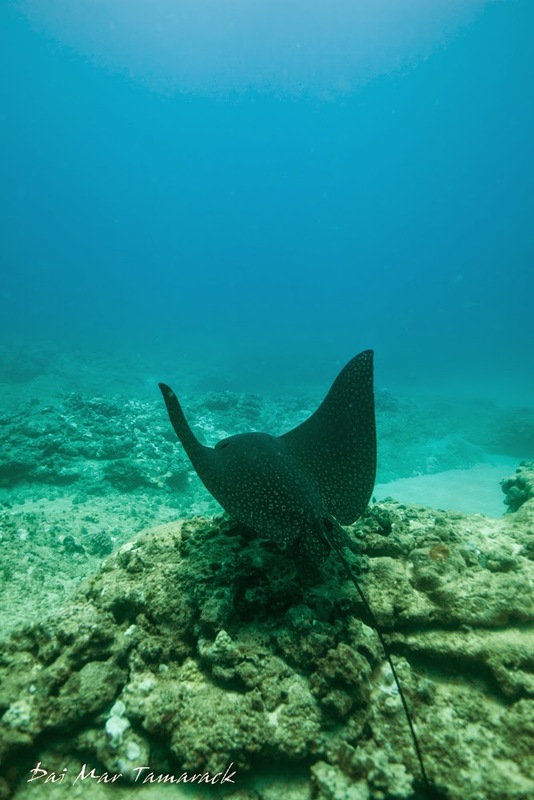 At one point a spotted eagle ray came within a few feet of the monk seal and seemed very startled as the monk seal turned and snapped at it. 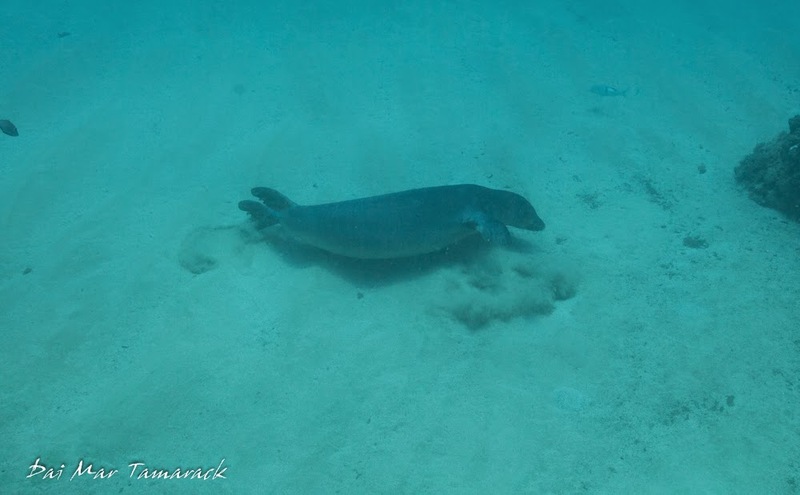 I have seen monk seals that are very curious on Maui but this one was quite timid. It kept looking over its shoulder to check up on us. We stayed with the seal for awhile on our way back but finally had to surface swim back after getting low on air. 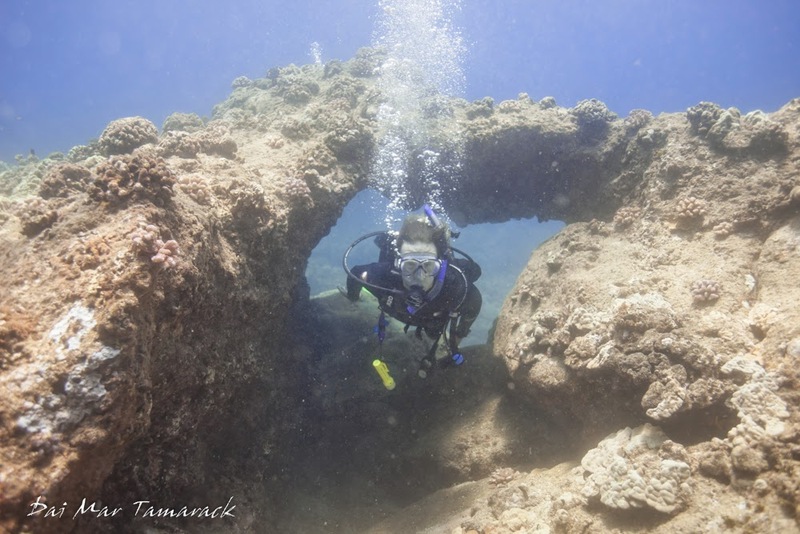 It was an incredible first Hawaii dive for Ed and my personal best dive on Oahu. I do miss the big waves on the North Shore during the summer but this is a pretty amazing alternative. 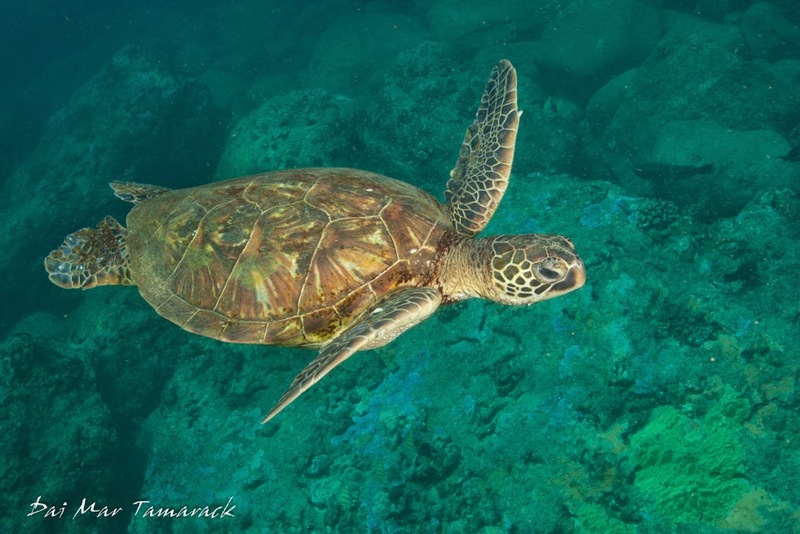 On a recent scuba dive at Shark's Cove on Oahu's North shore I had great success finding and photographing sea turtles. 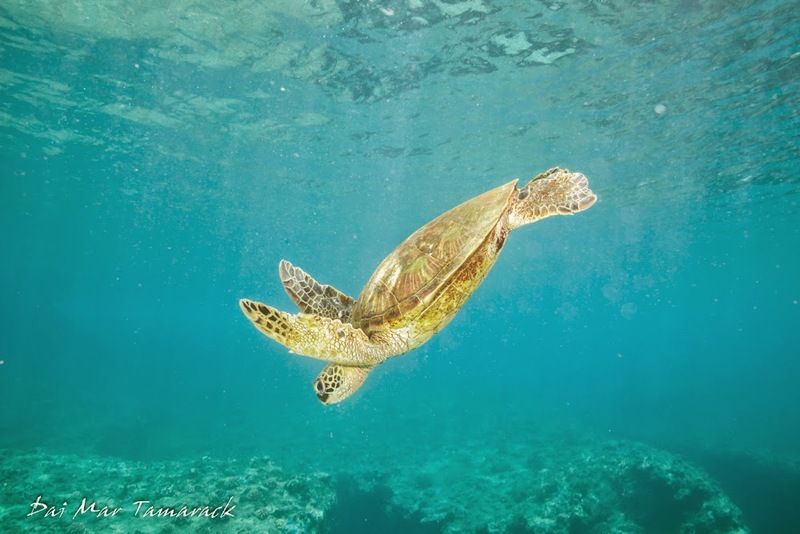 After that I decided to return to the North Shore with freediving gear so I could follow the graceful reptiles to and from the surface with ease. 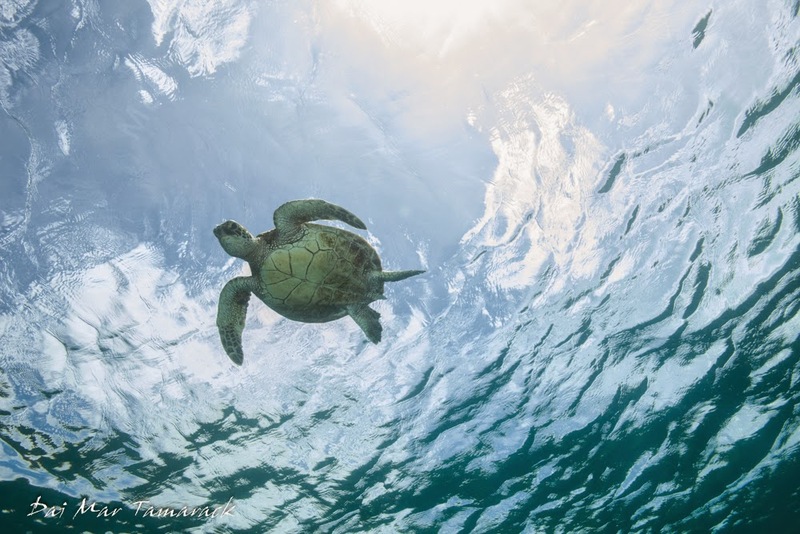 Sea turtles have lungs so they need to come to the surface every once in a while to replenish their oxygen. 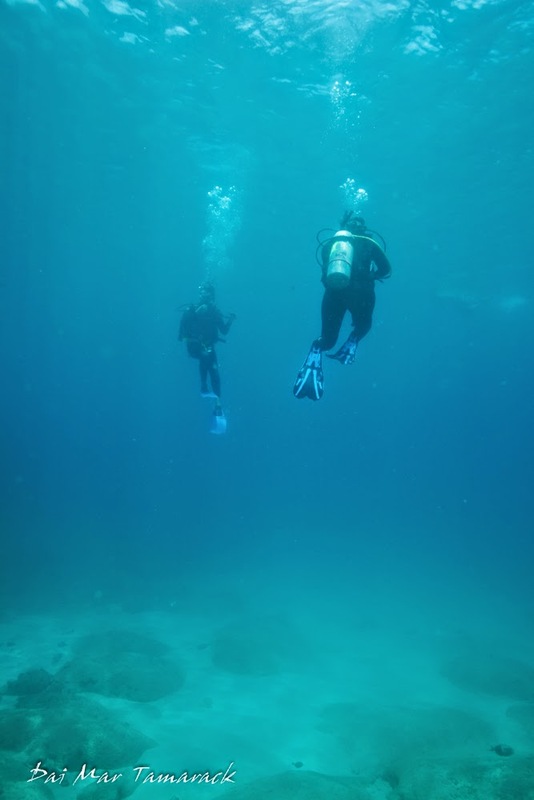 It is hard to bounce up and down while scuba diving. The freedom and maneuverability that comes with freediving can be a great way to photograph marine reptiles and mammals. 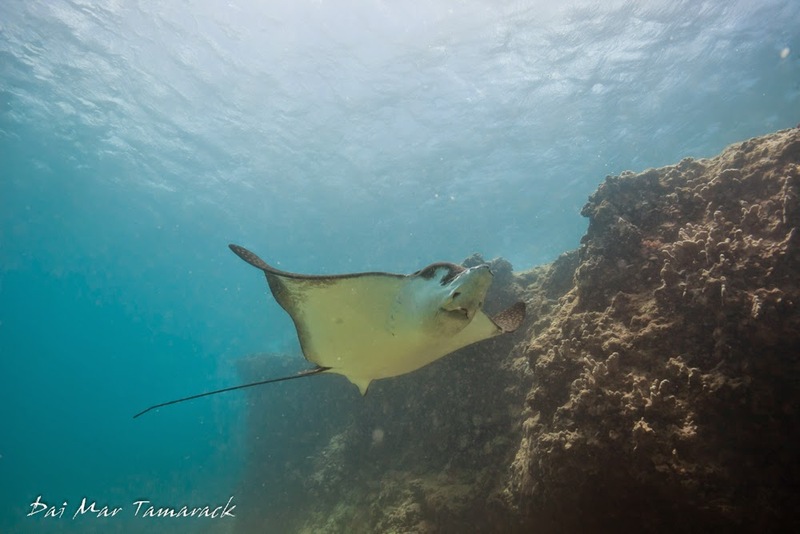 I took out a 24mm prime lens on my canon 5d mark ii in my Ikelite underwater housing. I also had two Ikelite strobes set up on either side of the housing to provide some light. 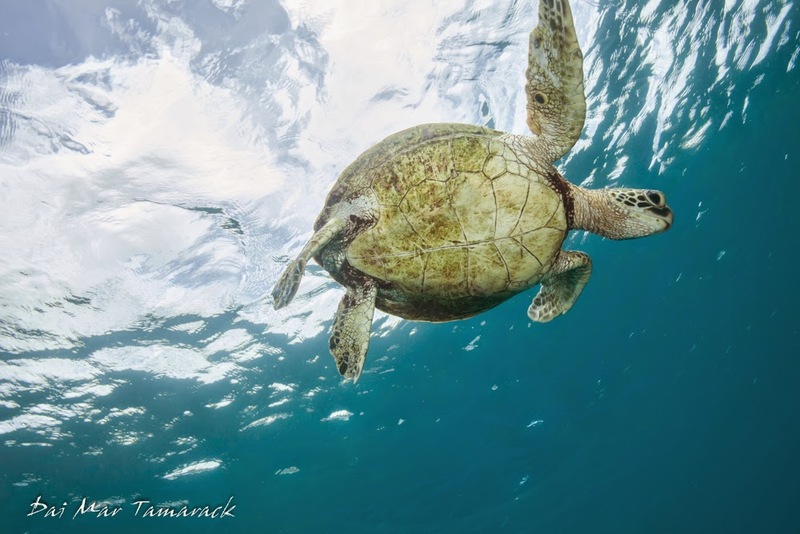 The strobes are important if you want more than just the silhouette of the turtle while photographing from below. It took about 45 minutes to find the first turtle. 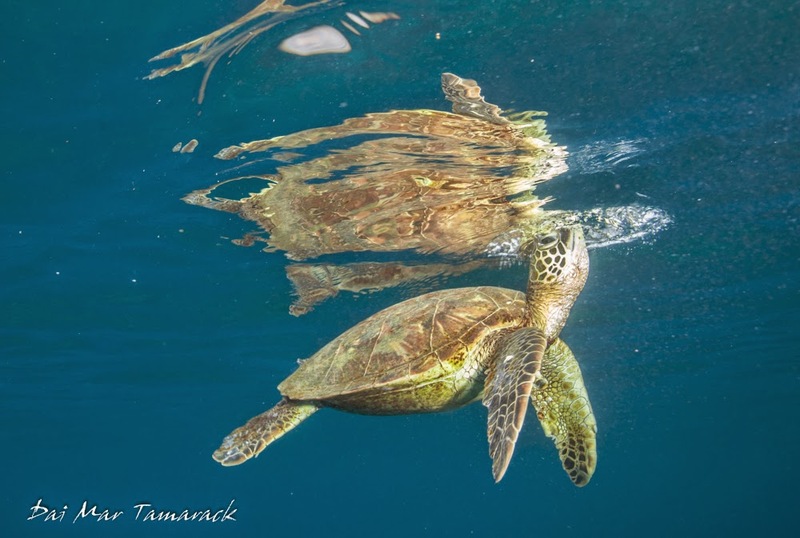 I ended up swimming with three different green sea turtles, all of which were juveniles. It can be difficult photographing young turtles because they are often quite timid around people. But on the flip side they do have the cleanest and best looking shells. 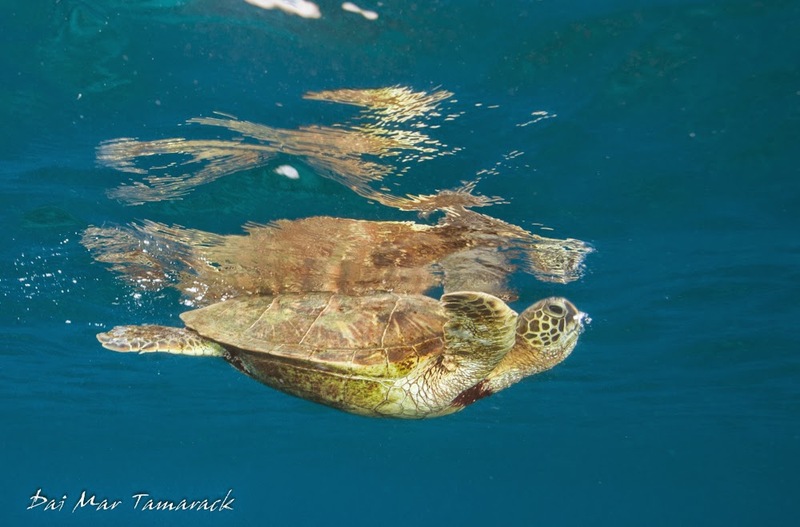 In my experience it is a good idea to swim very slowly with the turtle for awhile before going in closer for a shot. 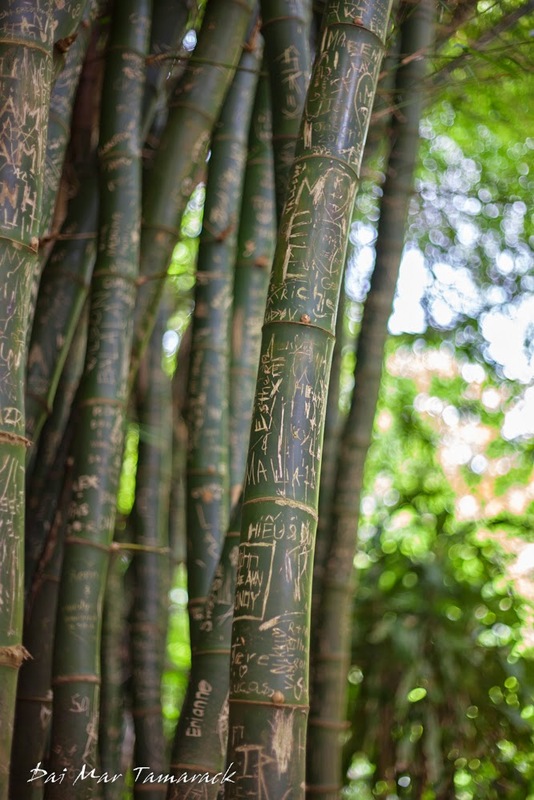 Letting them get accustomed to you will lessen your impact and possibly pique their curiosity. 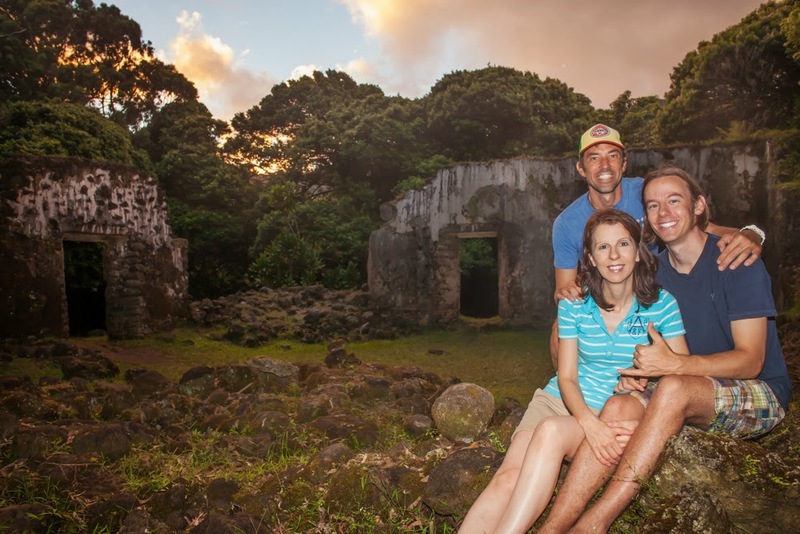 After finally convincing Nate and Kelly to make the move out to Maui, just as Heidi and I were switching islands to Oahu, they were finally able to island hop over to see us on our new island. 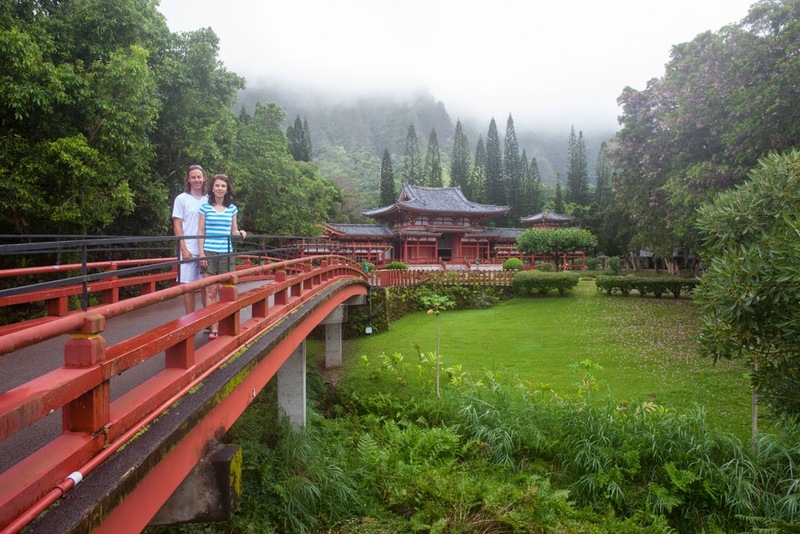 We only had two and a half days and I wanted to make it count so we crammed a lot into their quick Oahu visit. 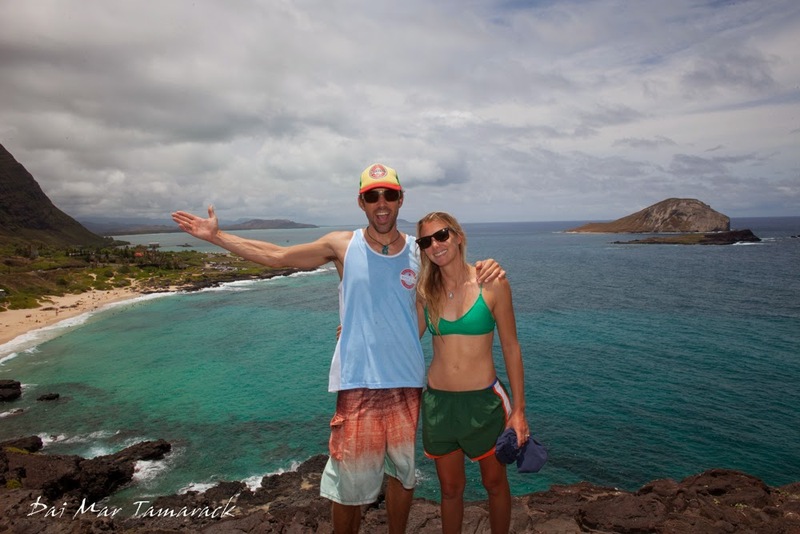 We had great weather, beautiful sunsets, fireworks, exploratory snorkels, and surf sessions. 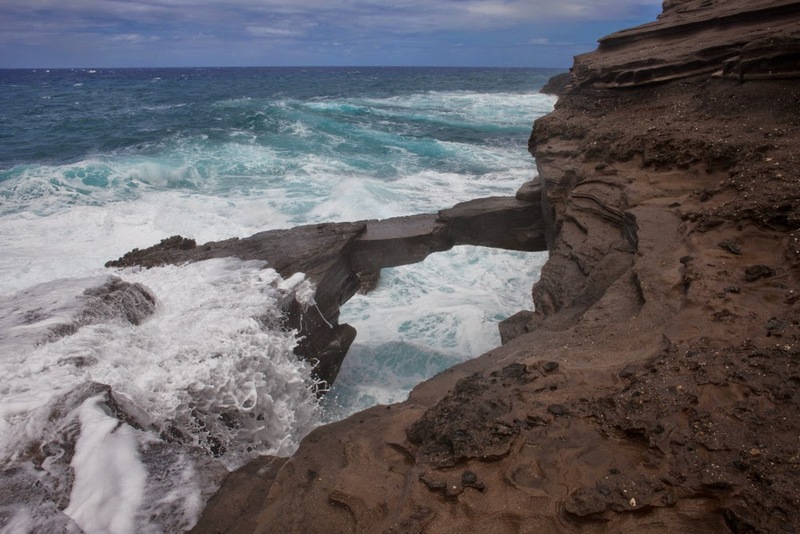 These pictures are from our exploration of the southeast coast of Oahu. The beautiful bay pictured above is a tiny stretch of beach called Eternity Beach. 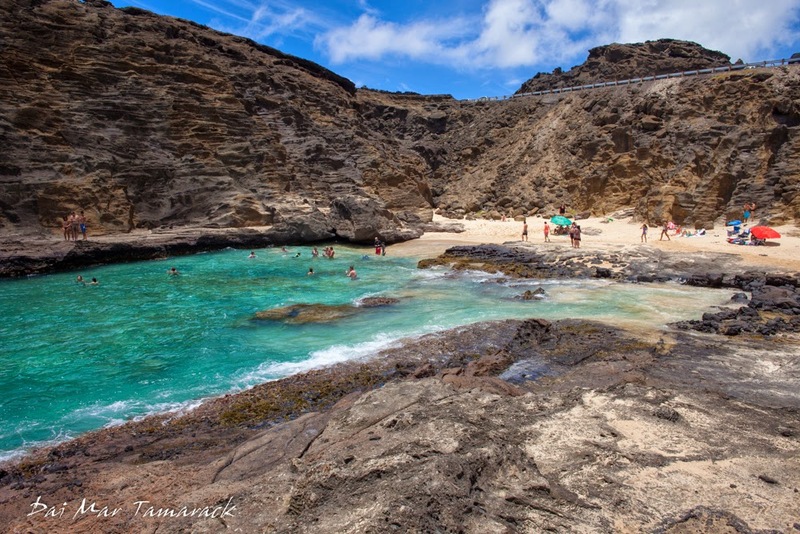 It was made famous by a movie in the 50's called 'From here to Eternity', starring Burt Lancaster. The cave goes from the beach all the way back under the highway. 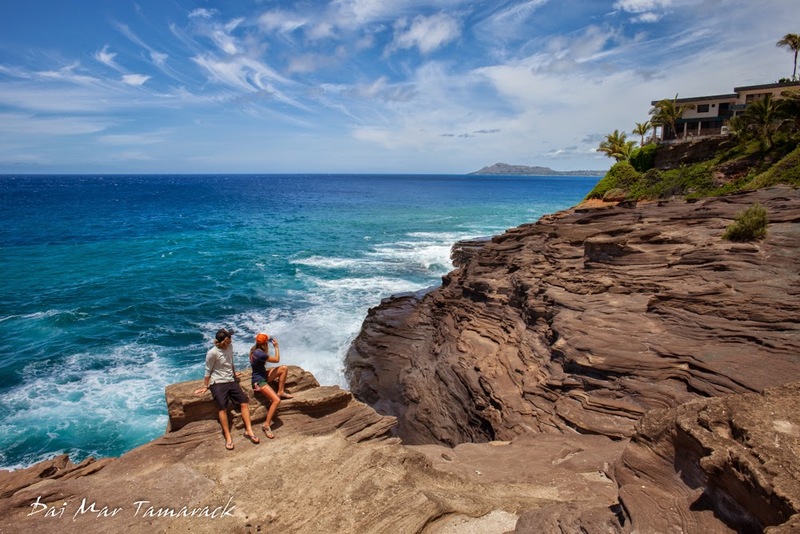 The pics below are from an overlook high above Makapu'u beach. The offshore island behind us in Rabbit Island, which did have a bunch of rabbits populating it at some point. Can you find Heidi, Nate, Kelly, and Dai Mar? We made sure to do a bit of hiking in the rainforest as well. 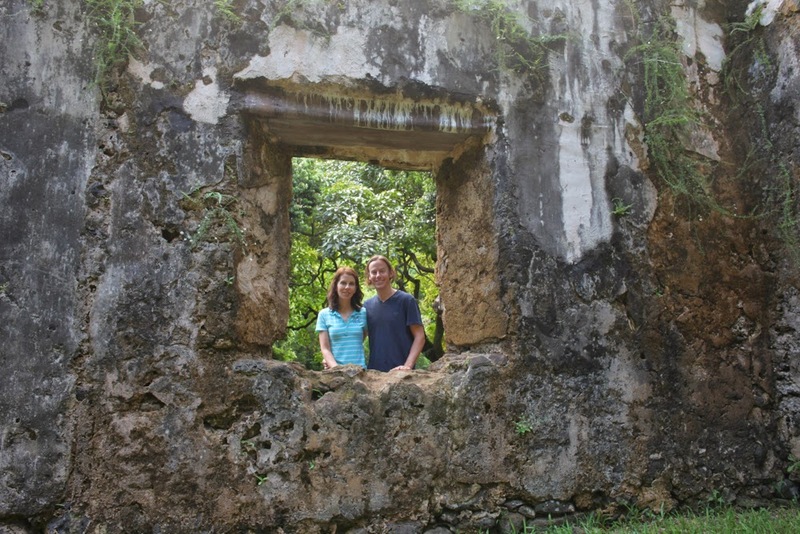 We found these old ruins deep in the jungle. 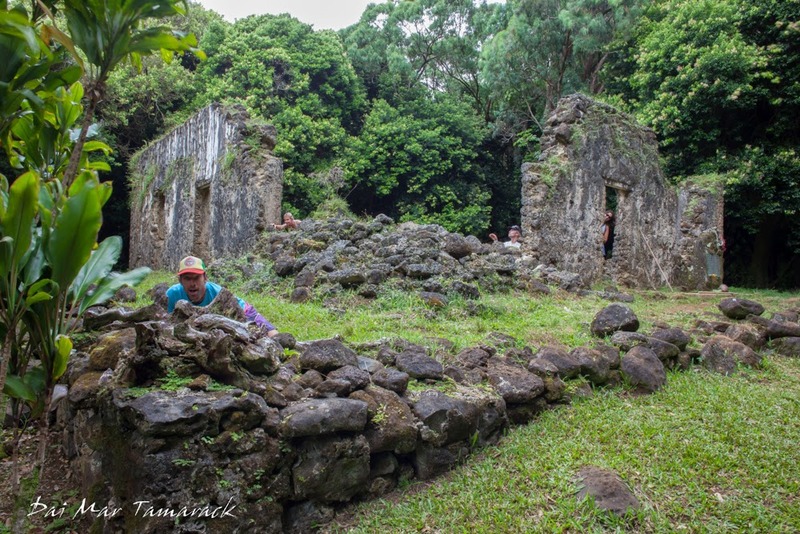 This was Kamehameha II's summer mansion before being left to the whims of the forest. 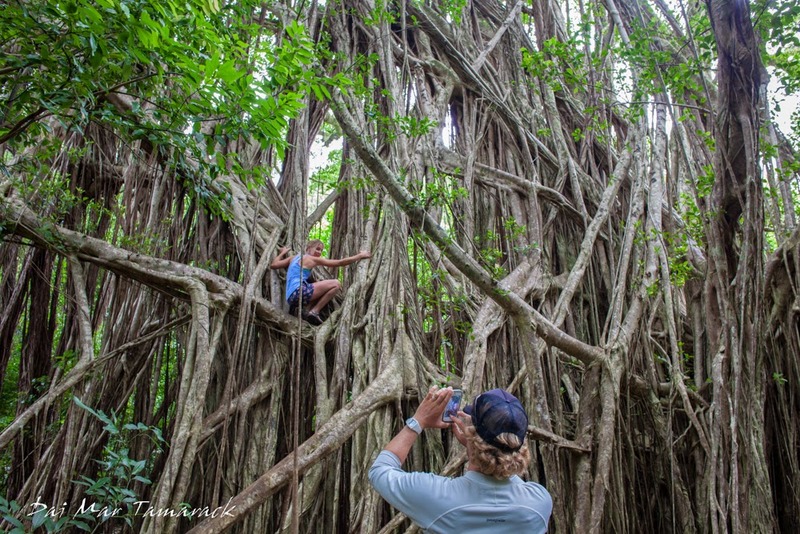 I lost Nate and Kelly while I was taking this picture of the gnarly tree through the ruined window only to find them down the trail climbing about in this huge banyan tree pictured on the right. The picture below is one of my favorite shots of Nate and Kelly from this weekend. It is from a place called Point Panic. It was taken after an eventful surf session and just after a beautiful sunset. 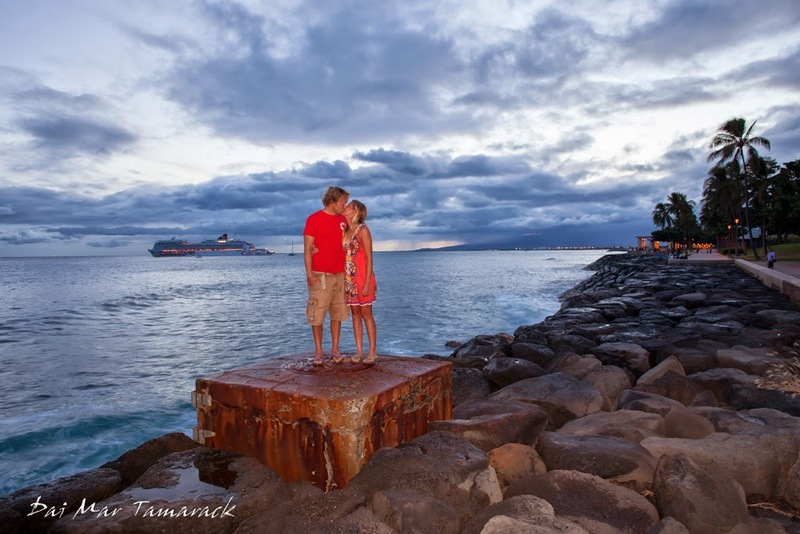 The massive cruise ship in the background had just left Honolulu harbor on its way to Maui. I am pretty lucky to have such amazing friends who are always up for adventure. I can't wait for the next big trip we all take together. 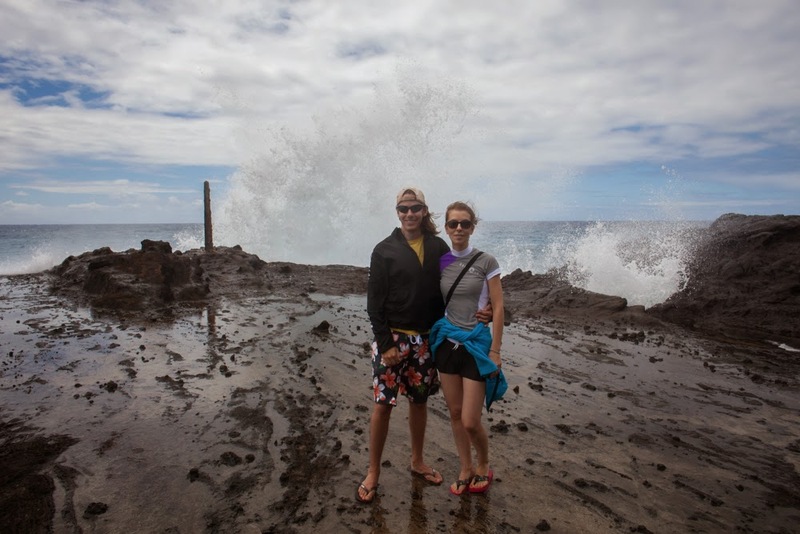 Mantas and lava flows on the big island anyone? 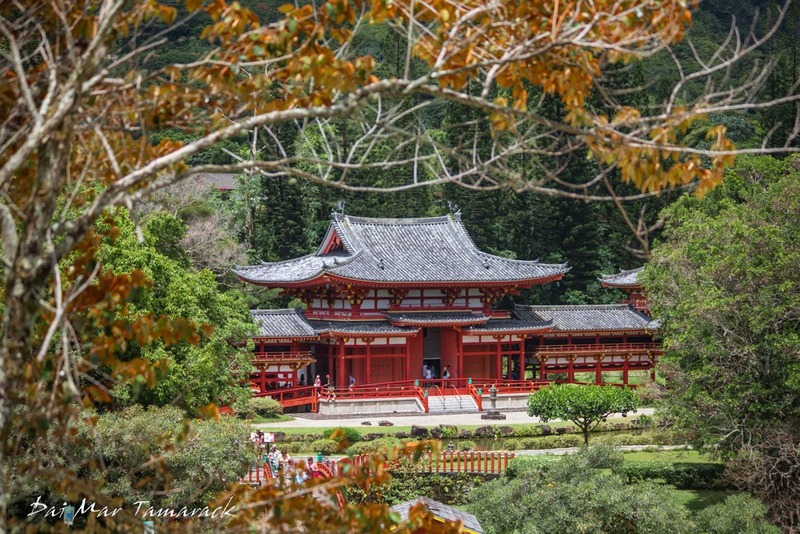 One of Oahu's hidden gems for visitors and photographers is the gorgeous Byodo-In temple. 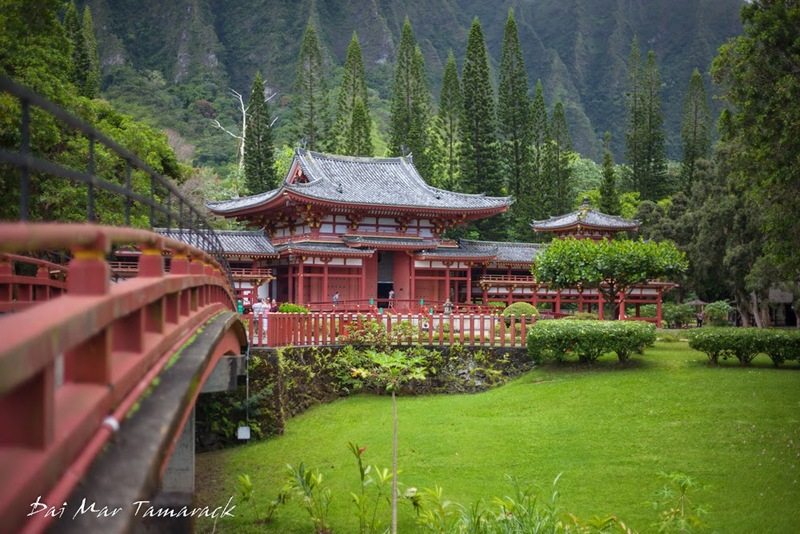 Located just past Kaneohe on Oahu's east side, this Buddhist temple is nestled up against towering green cliffs. 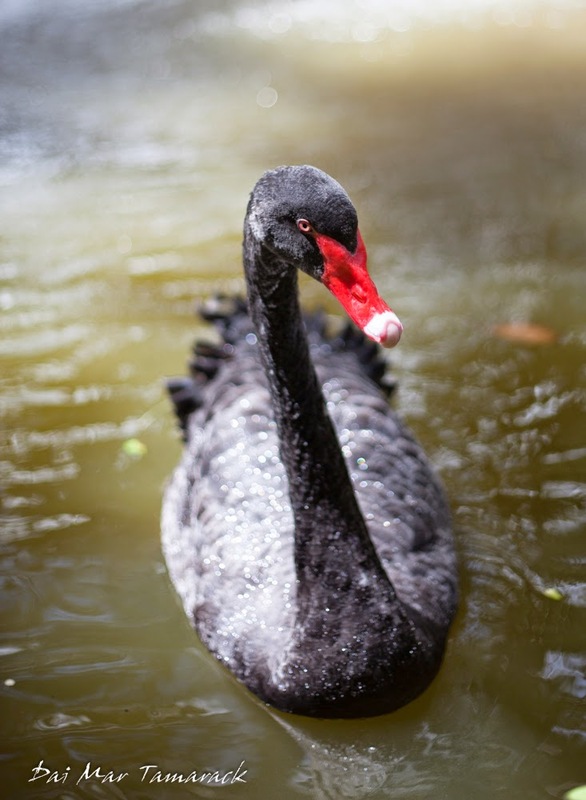 The reflection pool in front is filled with bright orange koi fish and black swans, and peacocks stalk around the grounds as well. 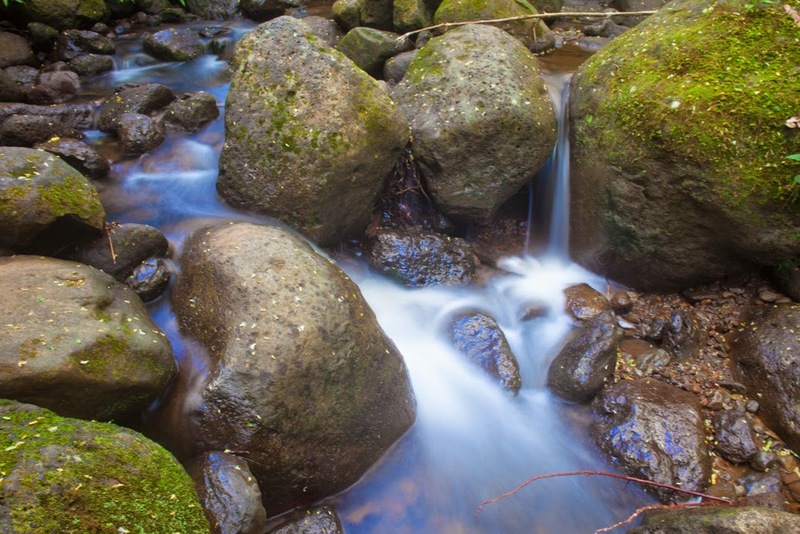 Whenever I come here with a camera I end up staying well over an hour. 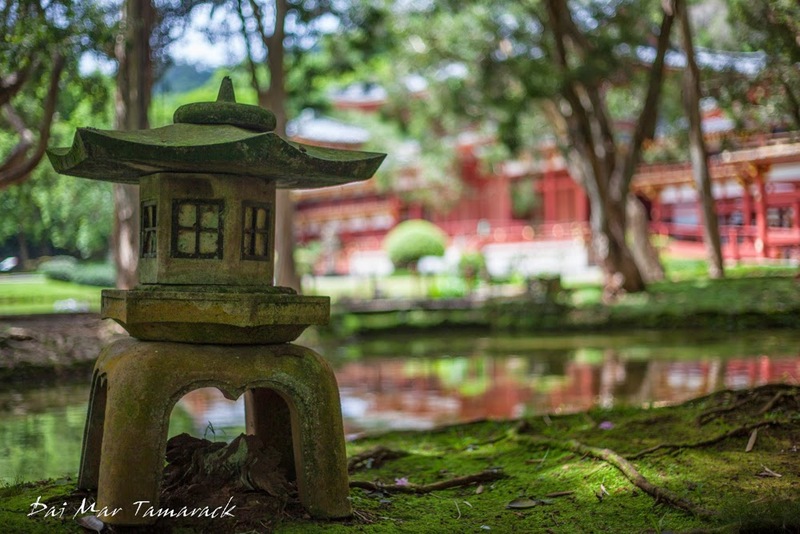 The temple itself is modeled after the ancient home of a Japanese aristocrat in southern Kyoto that was built in the 11th century. A massive bell can be rung upon entering the complex and the sound it makes is said to rid the mind of temptation and evil. 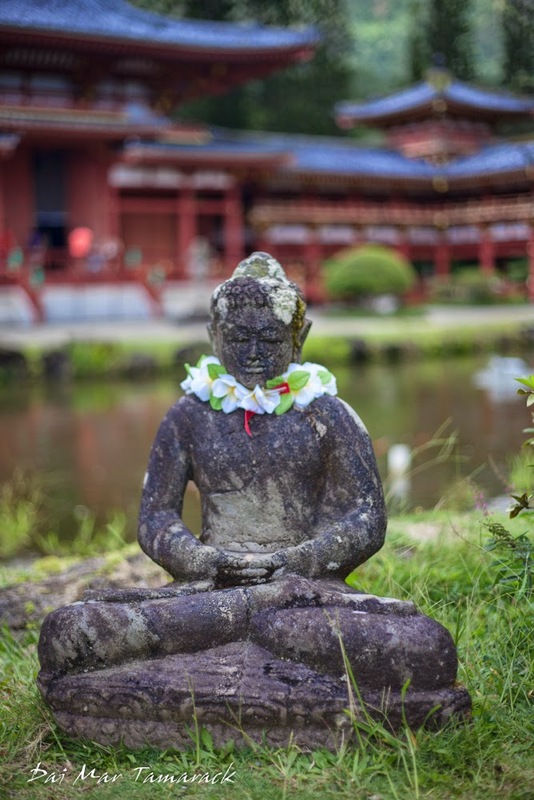 The center building of the temple houses a nine foot wooden statue of Buddha. The burning of incense as offerings and prayers are made in front of the Buddha statue creates an instant escape to the heart of Asia. 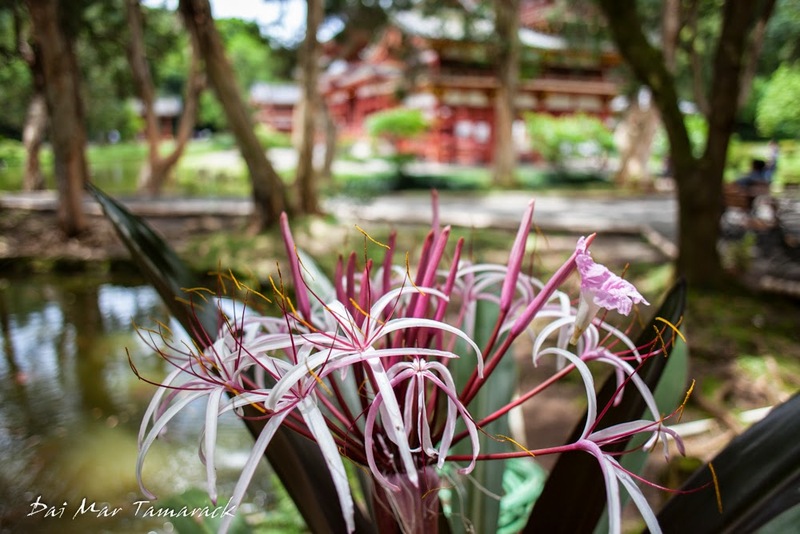 I am always transported back to my time in Japan when I enter the main prayer hall. 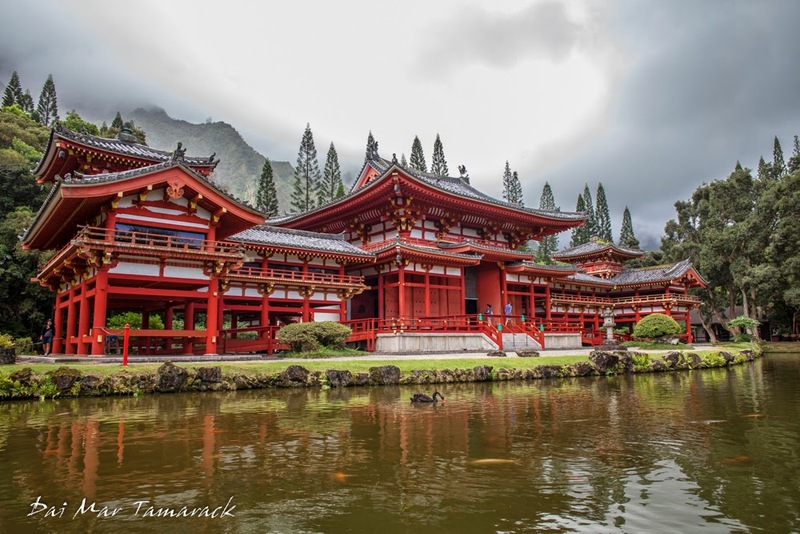 It often rains here near the mountains on the windward side of Oahu but the temple is just as beautiful on rainy days. Waterfalls form during downpours on the cliffs backing the temple. And clouds often obscure the tops of the cliffs giving off a mysterious, almost shangri-la, aura. The picture opportunities here really are endless. Every time I go back to this temple I find a new angle, different weather, or more animals to interact with. Entrance to the temple is $3 for adults and well worth it.